I’ll update more once I assemble all my pics, mainly from when I installed the coilovers and how the car looks today (with the Axis wheels n’ all). One last thing, the KW V3s, set at their “suggested” adjustments, ride noticably better than my stock “sport” suspension. If you have any questions, please leave a comment and I’ll get back to you. When I got back from Taiwan, I was looking forward to getting a new car.. I had narrowed my choices down to either an Acura TL, Infinit G35 Sedan, or used Lexus IS300 (to hold me over until the 2006 IS350 was introduced).. I didnt end up going with the TL because it was a front wheel drive car and as much as I liked my Civic, the way it handled was no comparison to the way my 2001 Lexus IS300 handled (but that’s not to say my Civic didnt handle well, because it did with my Carrera Bilstein coilovers.. it just didnt feel “light” like my IS300 did).. I ended up not waiting for the 2006 Lexus IS350 (yeah, I know, a mistake) because I didn’t think the back seats would be sufficient since I would be haulin’ my daughter to preschool and needed space for her Recaro baby seat.. in that regard, I am glad I have the G35 Sedan since the back seats on the IS350 were rated the worst in class by Car & Driver.. also I did like the VQ35 a lot.. it was beefy and torquey.. not as refined and civilized as the Acura TL.. in the G35, you know the VQ is there.. in the TL, the V6 tries to pretend like it’s not there..
My strategy was to keep the car relatively stock.. after all, it’s a 4-door with an automatic trannie.. I figured I’d just lower it and get some 19s or something.. I should’ve known better.. I just can’t seem to leave anything stock.. I actually purchased this a few weeks after getting my car. Tony, the owner of Motordyne, was posting on G35Driver.com about his new invention. He was offering a group buy at a substantial discount. After he posted his dyno graphs of the gains, I was convinced and placed my order. On most dyno graphs I’ve seen, the spacer made about 8-10hp at the wheels when tested on a Dynojet. 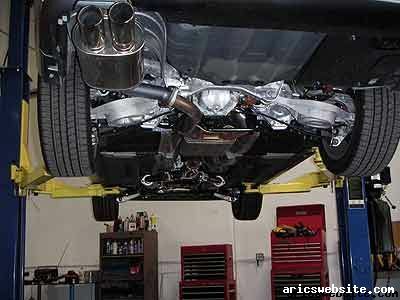 There was a lot of debate over the gains or whether it was a better decision to just go with an aftermarket plenum. I liked the spacer because (1) it allowed me to keep my stock engine cover, maintaining the stock appearance in case I had to take it to the dealer and (2) it was cheap. In character, my spacer is in my closet. I haven’t installed it yet because when I first received it, I wanted to wait until I had more mileage on the car so I could really tell if it made a difference. I also wanted to wait until Dynamic Autosports had finished installing their Mustang dynamometer. Ten months after purchasing the spacer, its still in my closet. I’ll install it one of these days and report back, but everyone that has bought one loves it. I went with the HKS Sport Exhaust because (1) it was cheap ($350 list, I think) and (2) it had dual tips. I was thinking hard about the Fujitsubo, but I didnt know if I would like the single tip. Also the Fujitsubo costs like $650 or something. The one thing I wasnt too thrilled about the HKS Sport Exhaust was that it was the muffler only, meaning it didn’t come with a replacement B-pipe. The HKS Sport Exhaust looks awesome and sounds great though. I figured I wasn’t REALLY getting a new exhaust to make crazy horsepower. I was really only interested in getting a bit more exhaust tone. 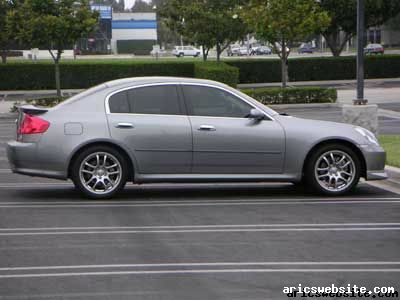 The 2005 stock exhaust was much better than the previous years, but it was still silent compared to the G35 Coupe or even the FX35. The HKS Sport Exhaust is much deeper than the G35 Coupe stock exhaust. After listening to my exhaust compared to the stock G35 Coupe or FX35, I can honestly say I prefer mine MUCH MUCH more. In fact, I don’t even like the G35 Coupe exhaust note anymore. I don’t know if I gained any horsepower. If anything, maybe 1-3 horsepower. But like I said, it doesnt really matter to me. One thing with the HKS Sport Exhaust is that after cruising for a bit (say, a 10 minute drive on the freeway), the exhaust does get louder. It doesnt drone though, and thats all that matters. It sounds awesome. I didn’t plan on getting a replacement y-pipe. It was a birthday gift from my friend. Originally he had ordered me the Gruppe-S y-pipe since it’s pretty much a copy of the Fujitsubo one. I had seen the Tanabe one, but I thought it was much more expensive. Turns out, they were about the same price. What makes the Tanabe one better is that it is really like a ‘Y’. Each section comes off the catalytic at an angle. Both sides meet in the middle, into a 2.5″ collector which connects to the stock B-pipe. 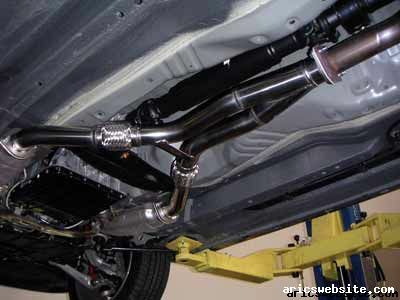 The Gruppe-S (and the Fujitusbo and stock one for that matter) comes off the cat, makes a 90 degre turn towards the middle of the car, where it meets the other side, then both pipes make another 90 degree turn down the middle, into a 3″ collector that connects to the b-pipe. So from underneath the car, it would look more like a ‘T’ rather than a ‘Y’. After installing the Tanabe Y-pipe, I noticed a pretty big difference. The car revved more freely and pulled stronger in 2nd and 3rd gears. With the VDC off, I get some decent scrub off the line (with no passengers). My gas mileage MAY have increased a little bit, but we’re talking maybe 0.5 MPG (I’ve been tracking every tank of gas since the car was new, yeah, I am a geek). The exhaust note got a bit deeper combined with the HKS Sport Exhaust. Also, at higher RPMs, it takes on a bit of a more raspy tone like the stock G35 Coupe/FX35 exhaust, although not as bad. I’d definitely recommend the Tanabe Y-pipe to anyone looking for an aftermarket y-pipe. The welds are nice and the y-pipe looks awesome. Too bad no one will ever really see it. I have no idea if this will get to you but I see that you mention someone named Mike Ferrara who owned a 69 Camaro – would this be the same Mike who went to El Toro High School in 1988? I am trying to track him down and say hi. Any info you could provide would be great.